Do I Need to bury the fence 18"? Discussion in 'Coop & Run - Design, Construction, & Maintenance' started by toripeeps, Jun 24, 2011. I thought I saw on some web page somewhere that your can use landscaping material at bottom of fence or bend fencing out at bottom around 18 " on top of the ground. Seems much easier but will it work? Thats what I did, Mine is about 2 feet out from the pens, over the years it has been "absorbed" by the grass, so it is real easy to mow over. I have never had anything dig into one my pens, but there have been numerous attempts all stopped by the wire under the grass. Here's my hardware cloth apron (before staking). It's attached to the fence with wire and then staked into the ground w/ heavy duty tent stakes. It's mostly invisible now and nothing has ever tried to dig in. Just lay it on the ground. Burying it is way, way too much work. What I did last year when I built two runs was use discarded carpet. I laid it so it was about 2 feet larger than the run on each end, and it completely covers the floor of each run. Nothing is going to dig through that any time soon, its nylon and will take years to rot. I could only get through it with a really sharp knife. On top of of the carpet is a deck style floor made from recycled pallet wood, and then I use deep litter over that. Has worked great. Even when the area flooded a bit this spring with all of the torrential rains, the litter stayed completely dry despite the whole thing being in a couple of inches of standing water. I used chicken wire for mine... I think it will work. Especially after i let the grass grow over it. 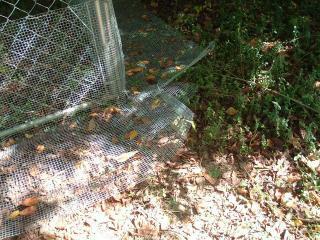 Quote:Chicken wire really will not keep most predators out. It's only good for keeping chickens IN. Heavy duty hardware cloth is the way to go. I used hardware cloth and ran it out 12 inches from sides of run. Dug down about 4 inches deep , pushed the wire down and shoveled dirt back on top. Then smoothed out and reseeded with grss. I can now mow right up to run and it seems to have worked for last couple of years keeping any digging animals out. I have read this time and again on this forum. 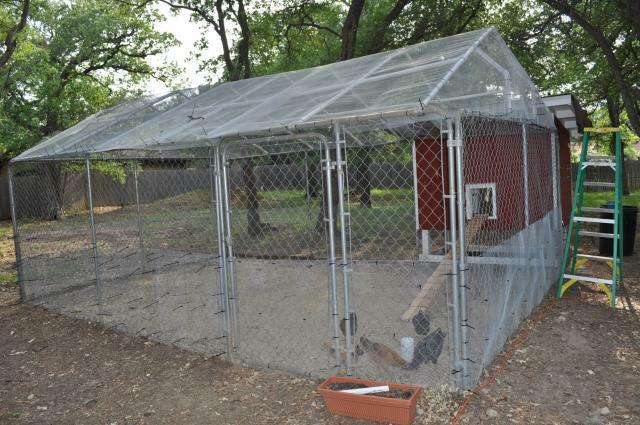 While I agree that chicken wire fencing will not keep a determined predator out, Does anyone have hard evidence that it will not deter digging under a fence if spread as an apron? We did 12 " out and its only buried about 2 inches. Basically just took a flat shovel and scraped the ground, put the hardware cloth down used 3 inch landscape staples to secure it and scraped the dirt back over it. The grass is starting to come in over the top and we have not had any issues with anything getting inside. Even my dummy dog who paws at it every time we go outside.